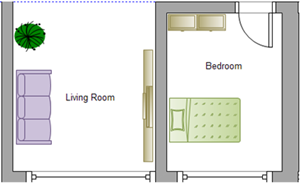 This floor plan tutorial is provided to help you understand how to create a floor plan. The easiest way to design floor plan is to do it based on the Edraw templates and examples. 1. Set the drawing scale. Drawing scale determines how a distance on the page represents a distance in the real world. You may need to set a proper drawing scale before designing according to the real area size. 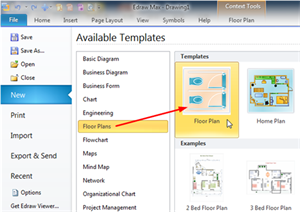 Go to Floor Plan menu of the Ribbon, input a drawing scale value in the box and click Set Drawing Scale button. Go to Floor Plan menu of the Ribbon, input a wall thickness value in the box, and click Set Selected Wall Thickness button to set for a selected wall; click Set All Wall Thickness to set all the walls at one time. 3. Set unit and precision. Go to Floor Plan menu of the Ribbon, click Unit and Precision buttons to set the unit and precision. 4. Display dimensions of the wall. There are two options: 1. Display the dimensions when selected. 2. Always display the dimensions. 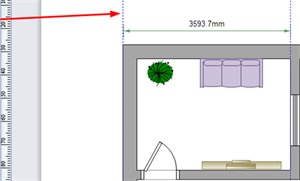 If you want to print or export the floor plan without showing the dimensions, then choose the first option. 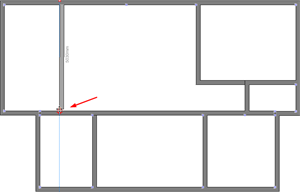 From Wall Shell and Structure library, drag and drop a room shape onto the drawing page. a. Drag the green endpoint. b. Double click the dimension text to type the length or width value. And the size will change accordingly. 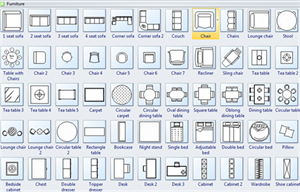 From Wall Shell and Structure library, drag and drop wall shapes onto the drawing page. Resize the wall by dragging the green endpoints or changing the length value. 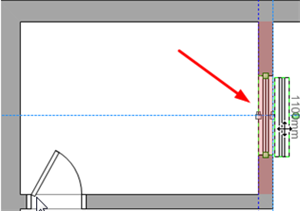 Connect walls by dragging one wall to another, when the endpoint turns red, release the mouse and two walls will be glued. Intersections between two walls are cleaned up automatically. Drag wall shapes and position them inside the exterior structure. 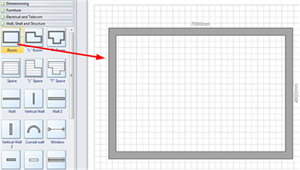 Resize the walls by dragging the endpoints or changing the length value. Drag an endpoint from one wall to another wall. The endpoints turn red when the walls are glued. Intersections between two walls are cleaned up automatically. 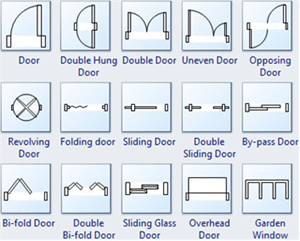 There are plenty of door shapes in the Wall, Shell and Structure library. Drag a door shape and approach it to the wall. When the wall turns to dark red, release the mouse, and the door will be automatically aligned and glued to the wall. To set the opening direction, you can either right click the door shape and set Flip option in the context menu, or go to Home menu to click Rotate and Flip button and set. Drag the yellow handle to change the door opening angle and direction. There are various window shapes in the Wall, Shell and Structure library. Drag a window shape and approach to the wall. When the wall turns to dark red, release the mouse, and the window will be automatically aligned and glued to the wall. There is a large collection of common used furniture symbols in the Furniture library. Drag a furniture from the library and drop to the position you want. All the furniture shapes are resizable, you can set the size by dragging the green endpoints or editing length and width value directly. To change the furniture colors, first select a furniture, then go to Home menu, Fill button for setting. Read Fills, Shadows and Patterns to learn more about the fill function. 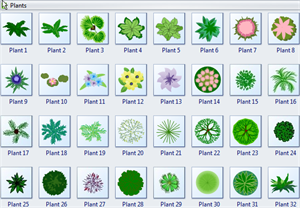 If you need plants for decoration, go to Plants library, there are plenty of plant images available. Drag a dimension line from Dimensioning library to a wall. To perfectly align with the edge of the wall, you can drag a smart guide from the ruler for alignment. From the floating button, it's easy to set the unit, precision, angle and extension lines options. Here are some complete examples of floor plans created by Edraw. You may start to design your own floor plans now! Download free floor plan templates. Check out complete office layout guide to get more details. Learn ultimate building plan tutorial to get more information.